Oh Sherrie, this is so absolutely adorable!! That garden cutie is so sweet!! I love the colors and papers you used!! This definitely makes me smile :) So precious!! Awww so super sweet, pretty colors too!! 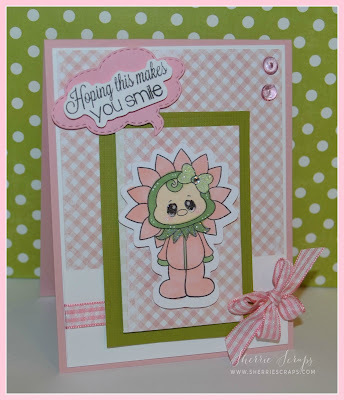 Pretty card, love the gorgeous papers and colors you used! Have fun with those sweet grand babies! This is so adorable and definitely made me smile!!! I love the soft colors! Wow, that is really adorable! 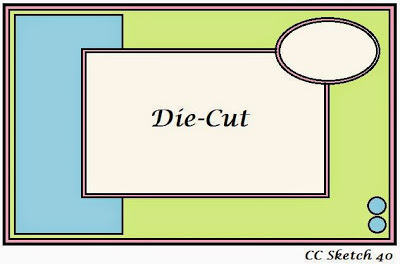 Thanks for joining us at Die Cuttin' Divas this week. YAY!!! You get to spend time with those sweet grand babies!! SNUGGLE Away my Friend! They're only little for a little while! :) Your card is darling! LOVE the pretty Pink & Green Color Combo... this is a great stamp set! It's one of my favorites! Enjoy your time with your Daughter & Grand Daughters! :) Have A Wonderful Day! This is so super adorable! What a beautiful color combo and sweet image! This is ADORABLE!! LOVING the colors and the image!!! And sounds like you had a busy but great weekend!!!! What a adorable card!!! Love the adorable image you used!! Thanks for joining us at DCD this week! Sherrie ! This is adorable ! Such a super card you have created ! Sounds like you are in for a wonderful time ! Hope you enjoy and get lots of snuggles ! Sherrie, This is so adorable! I'm in love with this cute little set! The colors you picked are so perfect for this stamp! Awesome take on the sketch!! Absolutely ADORABLE!! Your Card does make me Smile. It's so Sweet! Happy Day to You. Super cute card Sherrie! Such a darling image! Love all the pink gingham including the fancy bow! Absolutely precious. 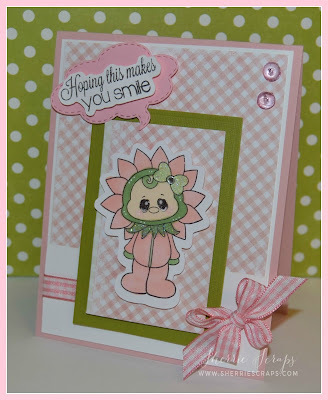 Love the image and pink and green papers. So girly. I love it! Super cute! Love the way you framed the image! Happy and fun colours and patterns. Thank you so much for sharing your talent with us at Loves Rubberstamps. Hope to see you back soon again! Super cute Sherrie, it made me smile.